Welcome to the next generation in conservation and pheasant hunting enthusiasts. In efforts to help our younger generation play a larger role in our efforts to conserve and provide habitat for upland game, our chapter provides today's youth with opportunities to learn about what Pheasants Forever is truly about. Minnesota provides conservation educational materials, safety of firearms and mentor youth hunts for those kids who may not have the same opportunities as most. Take a moment and read about our youth events or find out how you can become a key component of helping future Pheasants Forever Members. This years youth mentored hunt will take place on September 8th, starting at 8:00 am. 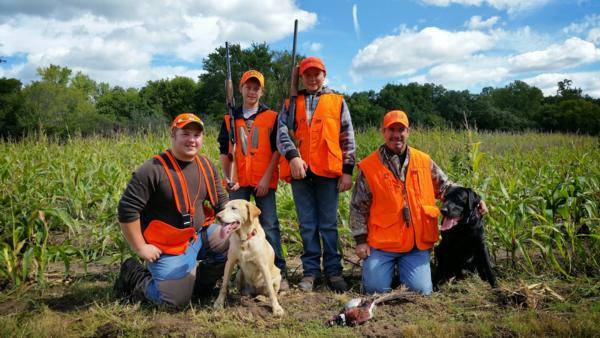 Kids can participate in the combination sporting clay/pheasant hunting event at River Ridge Gun Club - Courtland, MN. Note: For kids, minimum age is 11 and must have firearm safety certificate completed. 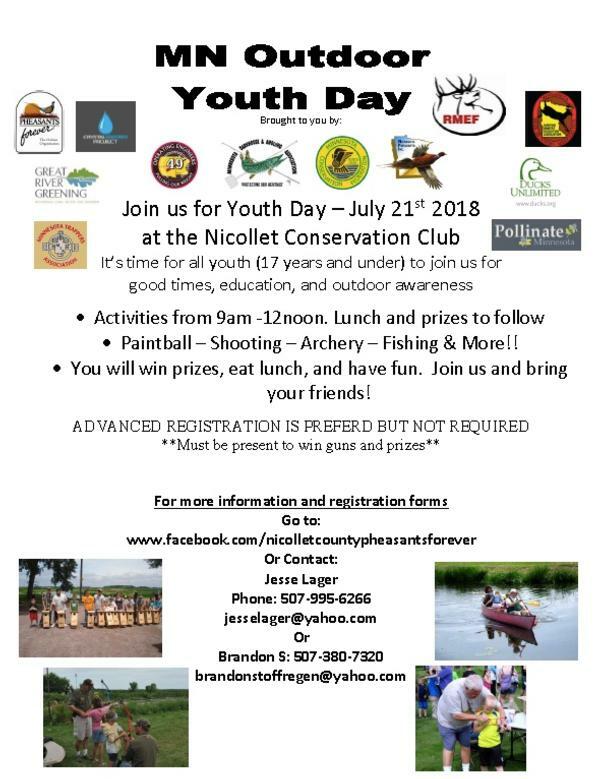 Join us for Youth Day - July 21, 2018 at the Nicollet Conservation Club for Paintball, Shooting, Archery, Fishing & More!! 9 am - 12 noon with Lunch & Prizes. Cost is $10.00 per youth. Pheasants Forever believes the future of conservation and our hunting heritage depends upon today's youth having the desire and opportunities to carry on the ethical traditions of this organization. At both the national and chapter level, Pheasants Forever is investing in sound programs enriched with events such as youth mentor hunts, conservation events and habitat projects. The Leopold Education Project (LEP) is PF's way of providing conservation education for its members, as well as formal and informal educators. The LEP is an innovative, interdisciplinary educational program based on the classic writings of the renowned conservationist, Aldo Leopold. The LEP was developed to teach the public about humanity's ties to the natural world and to provide leadership in the effort to conserve and protect the earth's natural resources. Brown County Pheasants Forever recently donated $1,000.00 to the Sioux Valley Gun Club to support their youth trap shooting program. 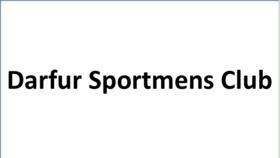 In addition to the Sioux Valley Gun Club, Brown County Pheasants Forever has made donations in the past years to youth shooting programs in Springfield and the Archery in the Schools program in Comfrey with the goal of encouraging new hunter recruitment and youth participation in the outdoors. 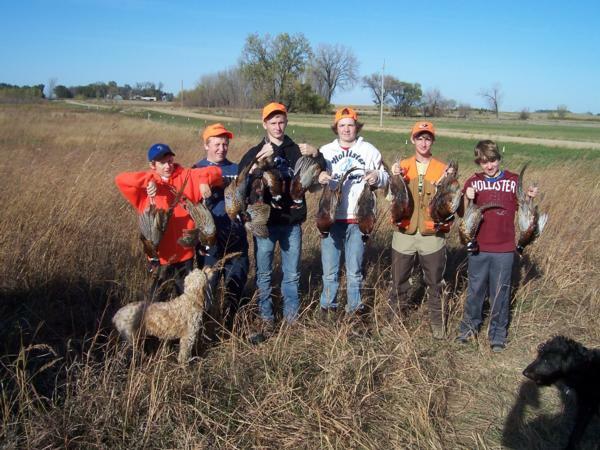 For more information on how you can help Brown County Pheasants Forever’s youth programs, contact a chapter officer. 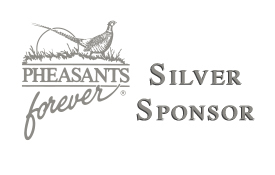 For the sixth consecutive year, Brown County Pheasants Forever is partnering with the New Ulm Chapters of the Izaak Walton League and National Wild Turkey Federation to raffle off a Minnesota lifetime hunting and fishing license to a lucky youth in attendance at the Annual Banquet. The raffle is free and only requires that the youth be aged 4 to 15 and be in attendance at the banquet. In addition to the lifetime license raffle, Brown County PF continues to promote youth outdoors through our annual Youth Hunt. 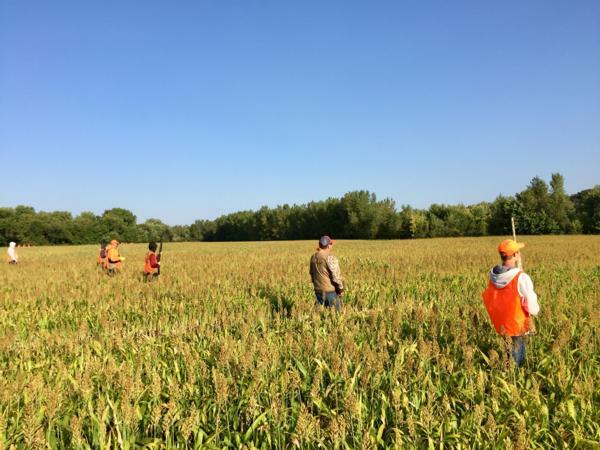 However, each September for the past nine years, Brown County Pheasants Forever has hosted a popular and successful Youth Hunt and field day at the River Ridge Gun Club in Courtland. 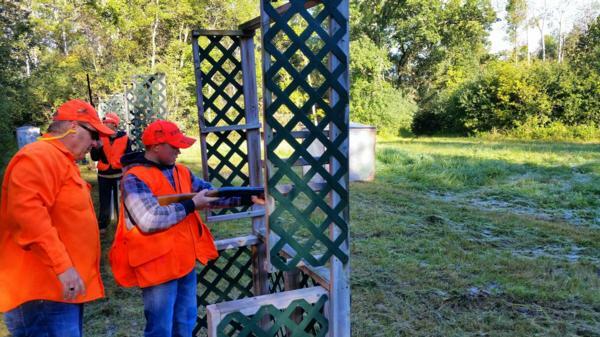 The event has given dozens of youth the opportunity to shoot sporting clays, win prizes, including a new shotgun and lifetime license, and most importantly, hunt pheasants. The event has been held each year at the River Ridge Gun Club near Courtland. The event location and size provide an ideal controlled environment in which to introduce inexperienced hunters to pheasant hunting while at the same time providing an enjoyable experience to participants. Brown County PF thanks its many volunteers. Volunteers are needed with dogs to help guide participants, to coordinate in the clubhouse, to assist on the sporting clays range, provide food and for general assistance.